Apply a few drops of the serum morning and evening to the affected areas before your normal skin care product (Avoid contact with eyes and mucous membranes) and massage in lightly until it has penetrated fully. Its light texture makes it readily and quickly absorbable, and make-up can be applied over it. To achieve even better results, use a IdealDerm Depigmentation mask once or twice a week. 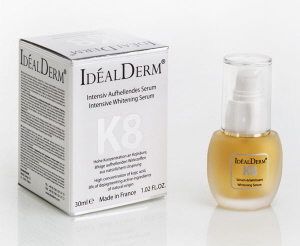 Pigment irregularities (brown spots, dark skin…) appear after excessive exposure to the sun (melasma), depending on skin tone, age (age spots) and sometimes after pregnancy (chloasma).The IdéalDerm K8 lightening serum is specially formulated to combat these pigment defects. It contains a high concentration of natural active ingredients designed to rapidly achieve satisfying results. The IdéalDerm K8 lightening serum prevents the appearance of brown spots and restores brightness and a natural even tone to the skin. In total an 8% concentration of depigmenting active ingredients of natural origin: kojic acid from KOJI malt, a pigmentation inhibitor; KOJI malt, the original concentrated ingredient in kojic acid; white mulberry a powerful melanogenesis inhibitor on the one hand and an antioxidant on the other. Enriched with Mimosa tenuiflora to effectively repair blemishes, active ingredients with anti-radical and protective but also anti-aging properties. Presentation: Bottle of 30ml / 1.2.FL.OZ. INCI: Aqua (Water), Butylene Glycol, Propylene Glycol, Glycerin, Hydroethylcellulose, Mimosa Tenuiflora Bark Extract, PEG-40 Hydrogenated Castor Oil, Kojic Acid, EDTA, Sodium Disulfite, Mulberry Root Extract/Morus Alba, Bearberry Extract/Arctostaphylos Uva-Ursi, Liquorice Extract/Glycyrrhiza Glabra, Scutellaria Root Extract/Scutellaria Baicalensis, Parfum (Fragrance), Ethylparaben, Methylparaben, Propylparaben, Citronellol, Lillial, Benzyl Salicylate, Linalool, D-Limonene, Geraniol, Hexyl Cinnam-Aldehyde, Methylchloroisothiazolinone, Methylisothiazolinone.